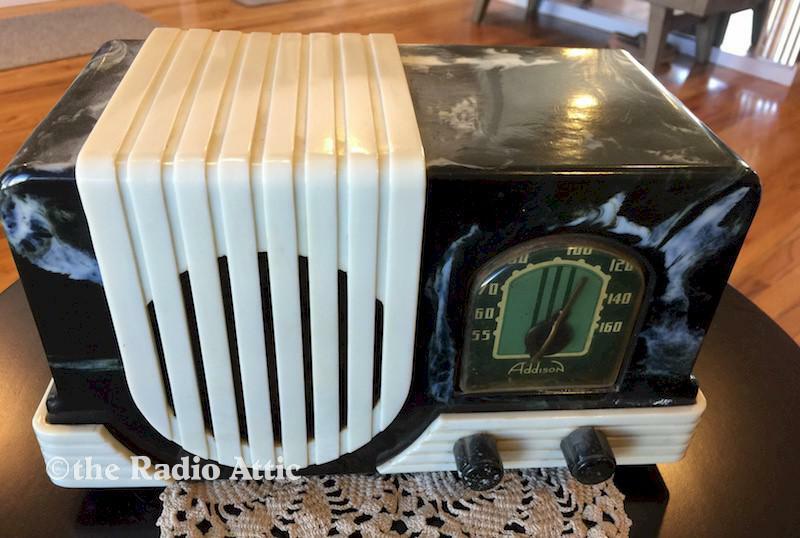 To see more of this seller's radios, visit Ken and Mona's Attic. This Addison A2A is beautifully marbleized in black (Navy blue?) Bakelite with creamy white Plaskon trim. This Art Deco radio features the famous "waterfall" speaker grille. The highly marbleized cabinet has one small hairline stress line on the left back side in the trim as seen in the picture. All else is in great condition. Even the original knobs are marbleized. Manufactured by by Addison Industries Limited in Canada Circa 1940. I will be happy to send more photos if requested.